Menulog delivers for Joy of india so you'll be able to track your courier on a map. 1 x Curry, 1 x Rice, 1 x Plain Naan, and 1 x Riata. 2 x Curry, 2 x Rice, 2 x Plain Naan, and 2 x Riata. Sliced Local brown SA Onion in a tasty lightly spiced chickpea flour batter. Mixed vegetable fritters in a delicious chickpea flour batter served with sauce. spiced potatoes green peas fresh tempered spices and coriander. Homemade cutlets of mashed potatoes served warm topped with creamy yogurt tamarind, mint chutney finished with red onions and fresh coriander. Puff pastry stuffed with spiced potato, coriander and green pea filling. A spicy curry of mixed vegetables (bhaji) cooked in a special blend of spices and served with soft bread pav shallow fried in butter. Minced lamb with fresh hebs pressed onto skewers and cooked in Tandoor. North India’s most popular Tandoori dish, tender spring chicken on the bone properly marinated for hours with spices, yogurt and Tandoori masala, cooked in the clay oven served with fine assortment of chutneys. Boneless spring chicken fillets marinated overnight &cooked in Tandoor. Bassa fillets marinated with lemon juice, aromatic spices and chick pea flour and deep fried served with Mint Sauce. Boneless pieces of chicken cooked in the aromatic chef’s special sauce of onion, tomato, ginger and spices. 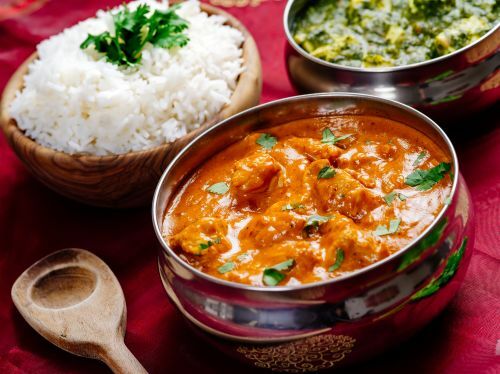 Tender boneless chicken, tandoori roasted then finished in a mild creamy tomato and onion curry. Tender pieces of meat cooked in a mild rich creamy sauce of cashews, ginger and coriander. Tender pieces of meat cooked in a south Indian style coconut based curry with mustard seeds, chili and curry leaves. Cubes of beef, lamb or chicken simmered in saag (spinach puree) finished with ginger tomato and fresh coriander. Cooked in a spicy vindaloo paste made of fresh chili, ground spice and vinegar. Rich dish from north India made with yoghurt and fresh herbs. Traditionally made with marinated lamb and cooked in a mouth-watering sauce. Fillets of chicken cooked in rich mango cream sauce. Boneless tandoori chicken cooked in a curry sauce with onion, capsicum and herbs. Chickpeas and potatoes flavored with traditional spices and tomato. Slow cooked black lentils finished in a cream, tomato puree and coriander. A traditional tempered Daal with garlic, chili, onion, tomato and fresh coriander. A favourite combination of potato, cauliflower, peas, tomato and spices. Aromatic dish of eggplant and sweet peppers prepared with peas and potato. Indian cottage cheese cooked in aromatic spinach puree with a blend of spices. Fresh local Garden vegetables tossed in tangy herb and Tomato sauce. Medley of veg cooked in rich cashew cream sauce. Cubes of paneer cooked in a creamy tomato sauce, ginger, capsicum and onion. Mashed potatoes and Cottage Cheese stuffed with nuts and raisins fried and cooked in Rich Cashew cream sauce. Fillets of fish cooked in Goan spices and herbs. Usually eaten with rice. Goan Specialty of seafood gravy with coconut, mustard seeds and curry leaves. King prawn cooked in mildly spiced coconut and cream gravy. King Prawns cooked with authentic spices, capsicum and spring onion. Made with freshly grounded herbs and spices with a touch of sour cream. A dish originated from the heart of Mumbai. Popular home-style curry cooked with fresh-pounded spices and curry paste. A flavorsome Preparation of Goat and Aromatic Rice. Chicken pieces cooked in gravy of tomato, onions, freshly cracked black pepper and coriander. Stir-fried rice with fresh assorted vegetables and spring onion. Vegetable dumplings stir fried in garlic and soya sauce. Stir fried noodle with mix vegetables and your choice of meat. A dish with Indo-Chinese origins which has been a crowd-pleaser for many years. Cooked with a variety of vegetables and spices. Cottage cheese stir fried with mixed peppers and onions tossed together in chilli garlic sauce. Garnished with fresh coriander. Indian bread cooked in our charcoal tandoori. A whole meal tandoori bread. Naan stuffed with tasty cheese & chili. Naan stuffed with tasty cheese & garlic. Naan stuffed with potato & coriander. Naan stuffed with dry fruit & nuts. Sweet mango chutney, mint chutneys and mixed pickles. Cucumber and yoghurt slightly spiced with roasted cumin powder. Saffron coloured basmati rice with peas, dry fruit and fried onion. Choice of Vegetarian, Lamb or Chicken. Indian milk based sponge balls, deep fried then soaked in cardamom rose syrup. Homemade Indian ice cream made with mango and vanilla.